Group study room use is limited to 2 hours at a time. 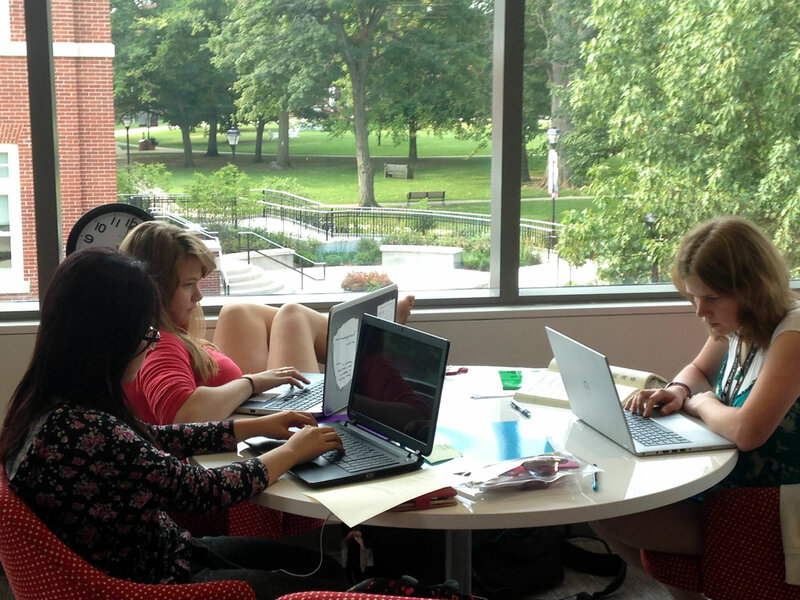 Seniors working on senior projects can reserve study rooms for recurring weeks for no more than 2 hours. To make a reservation, please contact Kendall Thompson. The main lobby is a unique space for students and faculty to engage in project work. The space is open for use by students 24 hours a day. A collaborative space with 11 PC computers and a short throw projector. 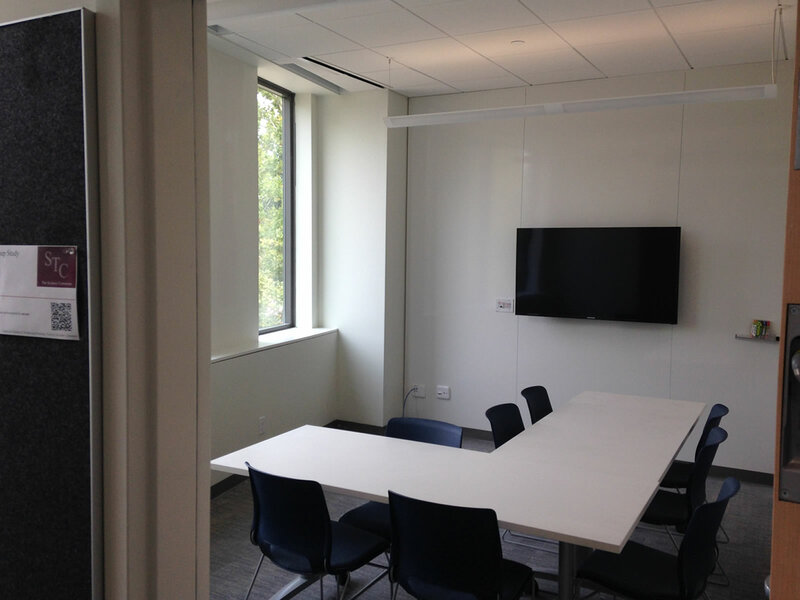 This space is open to the science commons and ideal for group work that is not lecture based. 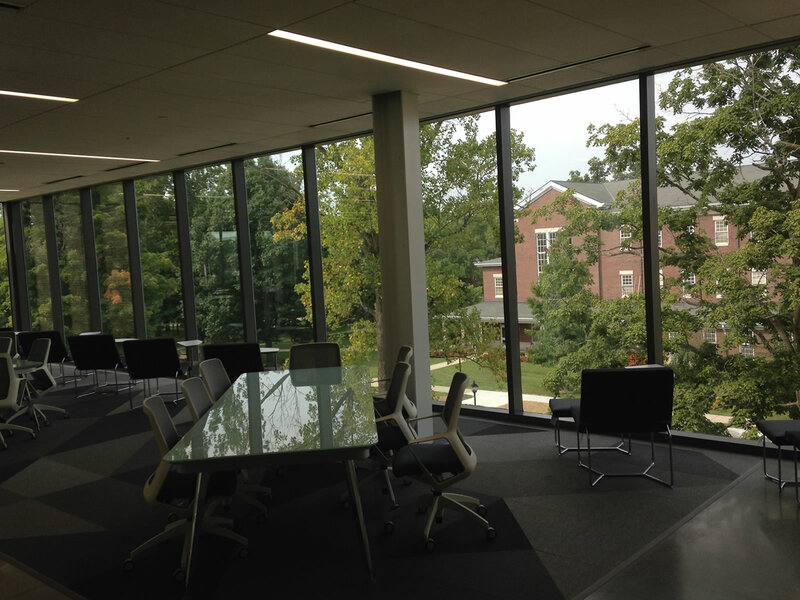 In the Science Commons, we have a 48 person collaborative space. During morning hours 8am to 4pm, this space is mainly used as classroom space. After 4:00pm this space becomes a group study collaborative space. The room has three projectors capable of projecting Bluray, HDMI, VGA and a document camera. Room 106 is located on the main level of the CST building, and comfortably fits 10–12 people. The room is equipped with a large screen TV. The room may be reserved by Earlham patrons only, and priority is given to reservations. If the space is not reserved, walk-in use is permitted. Use is limited to 2 hours at a time. All reservations are made through 25Live. Please contact Kendall Thompson if you need help reserving this room. This space provides a nice and quiet environment for independent study, quiet reflection, and reading. Access to key scientific journals and magazines for leisure reading or browsing are available. This room needs no reservation, and anyone can come in and enjoy the space. Room 302 is located on the 3rd level of the CST Building, and comfortably fits 4–6 people. The room is equipped with a large screen TV. Room 304 is located on the 3rd level of the CST Building, and comfortably fits 6-8 people. The room is equipped with a large screen TV. Room 308 is located on the 3rd level of the CST Building, and comfortably fits 10–12 people. The room is equipped with a large screen TV. The Fishgold Science Common Learning Integrated Technology Enhanced Classroom (LITEC), is located in the 3rd Level of the CST building. It is open to Earlham, Bethany, and ESR students, faculty and staff during regular STC hours. During the academic year this lab is regularly reserved for instruction; reservations take priority over general student use. 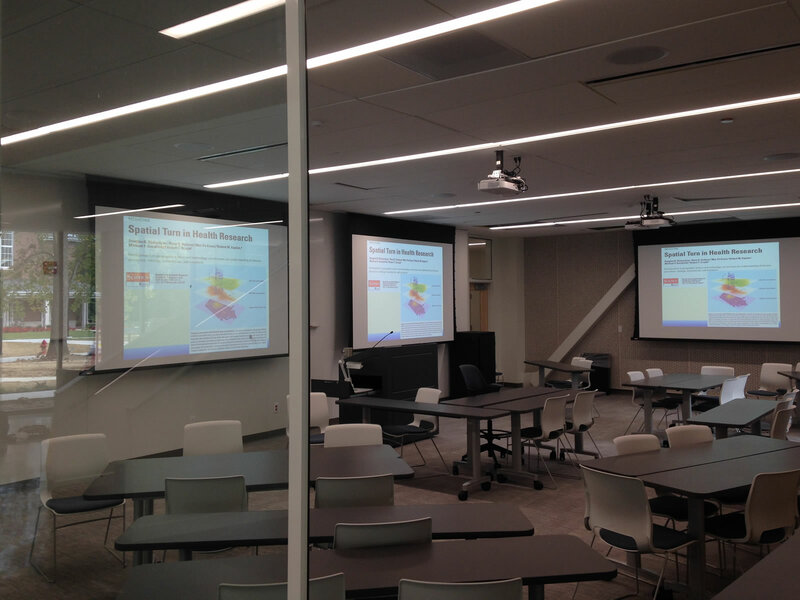 The room is equipped with five short throw projectors capable of projecting VGA or HDMI as well as 30 laptops. This space provides a nice and open space for groups, projects, and collaborative work. This space needs no reservation, and anyone can come in and enjoy the space.